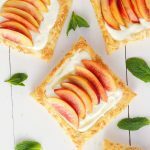 These Fresh Nectarine Tarts with Lemon Mascarpone Filling are light-tasting, and a delightful treat perfect for breakfast, brunch or even dessert! Preheat your oven to 400 degrees Fahrenheit and prepare a baking sheet with a piece of parchment paper. Using a knife or pastry cutter (a pizza cutter works great too! ), cut the sheet of puff pastry into 4 squares equal in size and shape and arrange them on the prepared baking sheet with lots of space between them. Slice a smaller square inside the larger one, creating a 1.5cm border around the edge of each piece of the puff pastry dough. Be careful not to slice all the way through the dough - just about halfway through the thickness of the dough. Use a fork to dock the inner square of puff pastry dough (poke holes in it). This will prevent the inner square from rising up as much as the outer border will when it's baking and it will create the perfect shape for the fillings. Beat the egg and the 1 tbsp of water and brush the borders of the puff pastry dough very lightly with this mixture. You'll have tons of the egg wash left over...don't overdo it, or you'll end up with very egg-y edges, and nobody wants that! Sprinkle the borders of the puff pastry dough with the turbinado sugar and bake at 400 degrees Fahrenheit for about 15 minutes, or until the pastries are a light golden brown, especially around the edges. When you take them out of the oven, immediately push down the middle square lightly with the back of a spoon or fork. It will probably have risen up a bit during baking and it's important that it's lower than the golden, sugary border. Let the pastries cool to room temperature while you prepare the mascarpone filling. Using a stand mixer fitted with the paddle attachment (or a hand mixer) combine the Mascarpone cheese with the powdered sugar and the lemon zest until the mixture is smooth. Fold in the whipped cream or whipped topping with a rubber spatula. Spread the Mascarpone mixture into the tart shells once they've cooled completely. Gently top with the slices of nectarine and a drizzle of maple syrup.